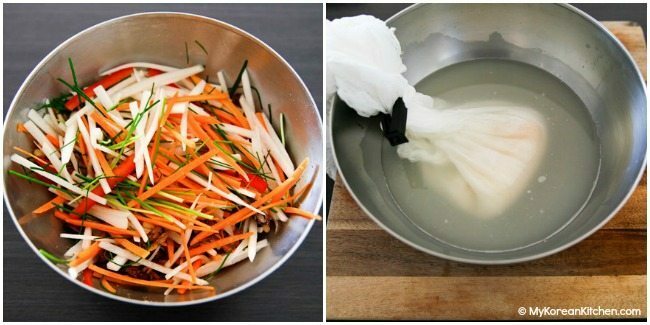 White Kimchi (Baek Kimchi) is a non-spicy kimchi variety that tastes mild and refreshing. It’s particularly popular amongst kids and spicy food cautious people. This recipe is vegan, vegetarian and gluten free friendly. When you think about kimchi / kimchee (김치) what comes up first in your mind? 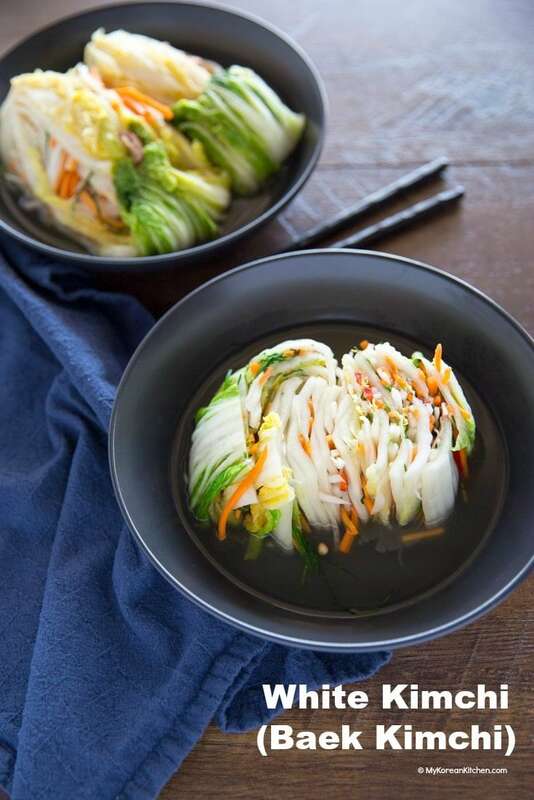 If nothing comes, how about this: Wickedly spicy looking napa cabbage kimchi! Well, at least that’s how my daughter thinks of kimchi in general! Lol. She calls any red kimchi (regular type) “bad kimchi” and white kimchi (Baek Kimchi) “good kimchi”, because it’s not spicy. As I mentioned already, Baek Kimchi (백김치, 白泡菜) means white kimchi. Unlike regular kimchi (spicy kinds) made with Korean chili flakes (gochugaru), Baek Kimchi doesn’t use any chili flakes. Instead, it is submerged in fruity salty brine. This is a very important sauce as white kimchi’s flavour depends on it. Some people add fish sauce and flour like you normally would when making regular kimchi, but I made mine without these. So you can appreciate the simplicity and the individual flavour even more! 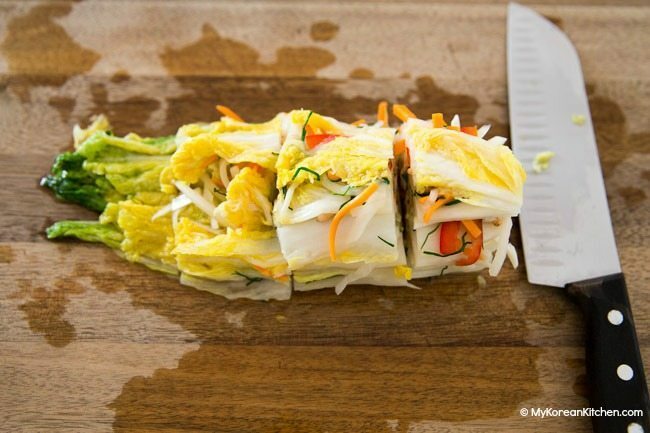 Another notable difference between the white kimchi and regular kimchi is that white kimchi is often stuffed with some fancy ingredients such as pine nuts, dried jujubes and chestnuts etc. While minimal, these ingredients do add subtle luxurious flavours to the kimchi, so I suggest you don’t leave them out if you can! It’s very easy to make (4 simple steps!) and friendly to your stomach, so I hope you give it a try soon! 1. Cut the cabbage into half then quadrants. Sprinkle the salt directly on the white part of the cabbage and pour the pickling brine onto the cabbage. Place a heavy object (e.g. a large salad bowl full of water) onto the cabbage to stop the cabbage floating and to help with the pickling process. 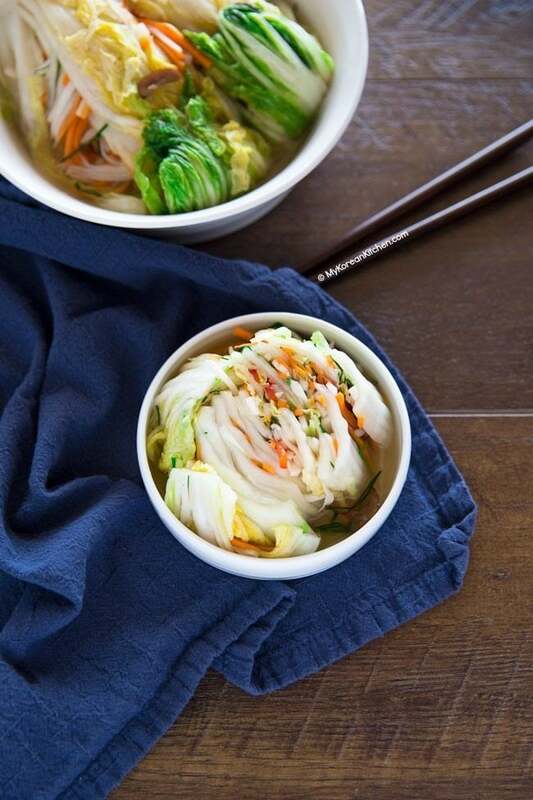 Leave it at room temperature until the white part of the cabbage is flexible (for about 1 hour 30 mins). During this time turn the cabbage over a few times to change the position (e.g. every 30 mins). Rinse the cabbage a few times in running water. Rinse off any residue salt. Drain and place on a strainer to drain off the water for 10 to 20 mins. 2. Prepare kimchi fillings during step 1 per instruction above (ingredients section). Also, prepare the kimchi brine. Mix the water and salt in a large bowl. Puree Korean pear, apple, onion, garlic and ginger in a blender. Place the blended ingredients into the strainer / cheese cloth and clip the top so that the food content doesn’t come out. Put it into the bowl (salty water from earlier) and soak the strainer / cheese cloth. Squeeze out all the juice from the strainer / cloth to dissolve into the water. 3. Place the pickled cabbage (from step 1) onto a clean board. 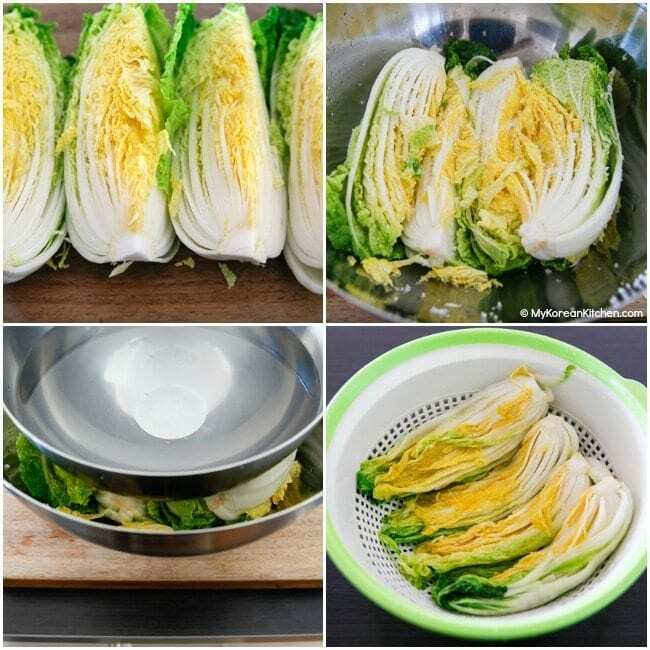 Starting from the bottom leaves, fill the cabbage with kimchi fillings, evenly, one layer of cabbage at a time. Once done, place the kimchi into a large container, facing down. (I used a 5L container for this recipe.) Repeat this step with the remaining ingredients. 4. Pour the Kimchi brine (from step 2) into the kimchi container. 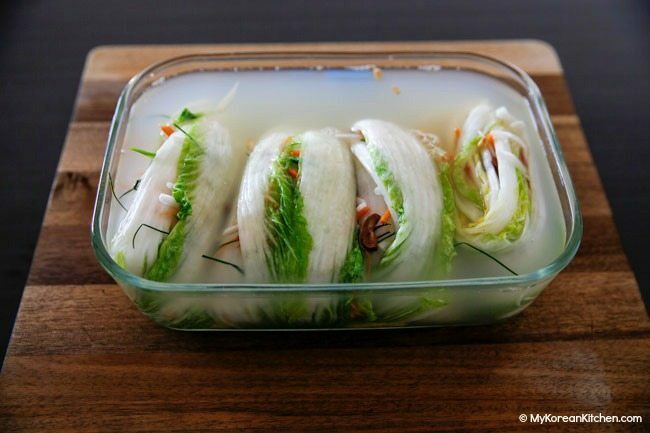 Place a heavy stone or a plate on top to stop the kimchi floating and submerge the kimchi well in the brine. Close the lid. Leave at room temperature for 12 hrs (in summer) / 24 hrs (in winter) then transfer it to the fridge. 5. You can start serving the kimchi from about day 3. Though it tastes better as it ages (from about day 7) but before it turns too sour. Cut the kimchi as you need before serving. (I normally cut one whole quadrant slice at a time.) Serve the sliced kimchi on a plate and add a few scoops of the kimchi brine on top of the kimchi. 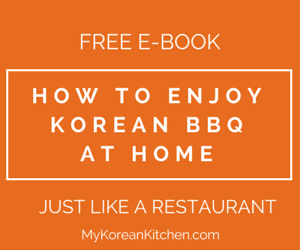 Mild and refreshing White Kimchi (Baek Kimchi) recipe. Cut the cabbage into half then quadrants. Sprinkle the salt directly on the white part of the cabbage and pour the pickling brine onto the cabbage. Place a heavy object (e.g. a large salad bowl full of water) onto the cabbage to stop the cabbage floating and to help with the pickling process. 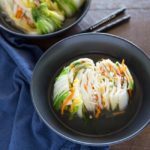 Leave it at room temperature until the white part of the cabbage is flexible (for about 1 hour 30 mins). During this time turn the cabbage over a few times to change the position (e.g. every 30 mins). Rinse the cabbage a few times in running water. Rinse off any residue salt. Drain and place on a strainer to drain off the water for 10 to 20 mins. Prepare kimchi fillings during step 1 per instruction above (ingredients section). Also, prepare the kimchi brine. Mix the water and salt in a large bowl. Puree Korean pear, apple, onion, garlic and ginger in a blender. Place the blended ingredients into the strainer / cheese cloth and clip the top so that the food content doesn’t come out. Put it into the bowl (salty water from earlier) and soak the strainer / cheese cloth. Squeeze out all the juice from the strainer / cloth to dissolve into the water. 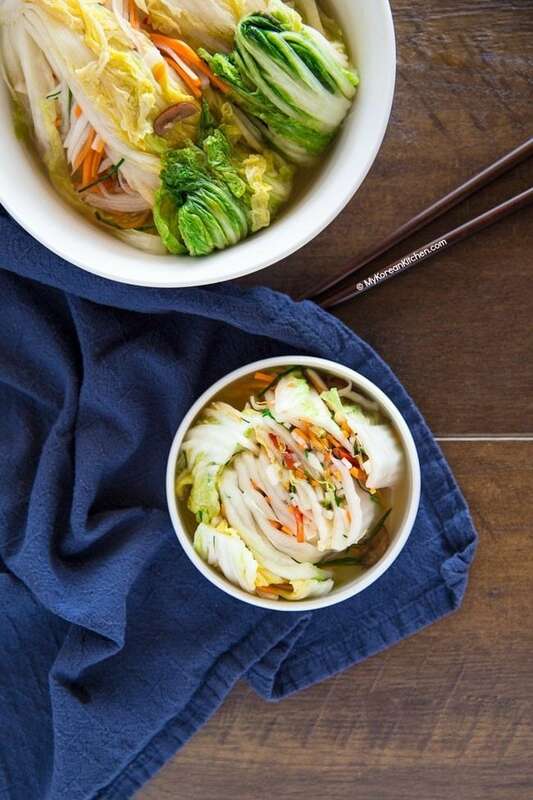 Place the pickled cabbage (from step 1) onto a clean board. 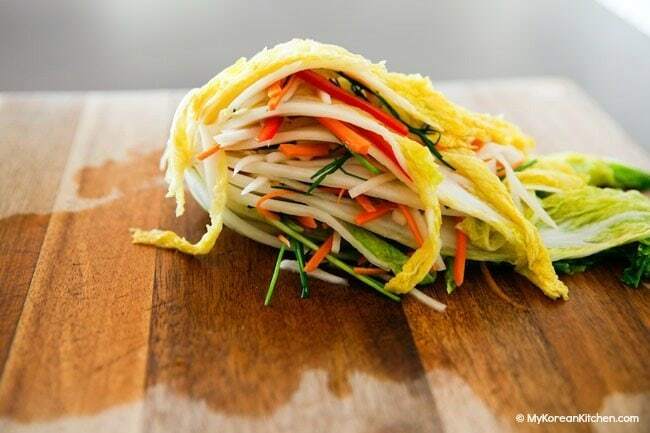 Starting from the bottom leaves, fill the cabbage with kimchi fillings, evenly, one layer of cabbage at a time. Once done, place the kimchi into a large container, facing down. (I used a 5L container for this recipe.) Repeat this step with the remaining ingredients. Pour the Kimchi brine (from step 2) into the kimchi container. Place a heavy stone or a plate on top to stop the kimchi floating and submerge the kimchi well in the brine. Close the lid. Leave at room temperature for 12 hrs (in summer) / 24 hrs (in winter) then transfer it to the fridge. You can start serving the kimchi from about day 3. Though it tastes better as it ages (from about day 7) but before it turns too sour. Cut the kimchi as you need before serving. (I normally cut one whole quadrant slice at a time.) Serve the sliced kimchi on a plate and add a few scoops of the kimchi brine on top of the kimchi. I love your recipes and want to try this one! I am a little confused,though about the different brines/pickling brines. In step two you say to put the cloth wrapped fruit purée into the « bowl (salty water from earlier) .»Is this the liquid used for pickling the cabbage (step 1, 4c water, 3/4 c salt) or the kimchi liquid (4c water, 1tsp salt)? Hi Becca, that would be the kimchi liquid. Enjoy! Thank you for the recipe! I’ve tried out your recipe once already and it was really really good. However, I do have a question about the measurements. When you say 1 cup of water, do you mean 250 ml water? And 1 cup of salt is 125 g of salt? Looking forward to the clarification! Did I miss something or don’t you ferment your kimchi? Hi Kelly, I don’t understand your question. Fermentation is a process that naturally occurs as kimchi ages. It should naturally start from step 4 above. (Though killing bad bacteria starts from step 1 and good bacteria / lactic acid bacteria is known to survive this step.) Kimchi still ferments while it’s stored in the fridge (step 5), at a slower rate. Hope this helps. I would like to ask if there is any alternative I can use for bosch or korean pear. Im living in Abu Dhabi. And it is very hard to find these kind of fruit here. Hi Sue. 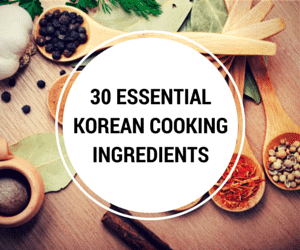 Thank you, am searching for non spicey Kimchi and I found your recipe. But I wish to clarify one step. We pureed the pear, apple, garlic, ginger and onion together. But we only squeeze the juice out instead of adding everything into the mixture. Thank you very much for your kind clarifiction. I am eating Kimchi for health reason. But I am allergic to chilly and seafood, thus was searching for a non spicey and non seafood content kimchi recipe when I saw yours. This white kimchi recipe is the answer I was looking for. We love Korean food at my house, but I am not such a fan of spicy. I will try this, I know its full of probiotics and the flavor must be awesome. I will let you know how it turns out. Thank you for your good work. Do you think it would be possible to can this recipe? Make a big(gish) batch beforehand and save some for later in the year? Or will it sour? Typically the best before date for kimchi (stored in a plastic air tight container) is 90 days. Yes, this kimchi will be very sour by the end of 90 days. With this recipe, I wouldn’t store it for 1 year. This looks yummy and delicious!! images also nice, thanks for sharing this recipe. 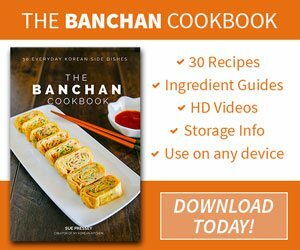 Thank you for this recipe, I was just about to google a white Kimchi recipe when up this pops!! Your photos are fabulous and play a big part in making your recipes very doable by everyone. I have one modification that I will do when I make this; I will cut the filled quadrants into thick slices and pack them into a wide-mouthed jar carefully keeping them together, then once fermented I can take out a wedge or two without needing to remove a whole quadrant – I am making it just for me! This looks really delicious! The contrasting colors are beautiful. 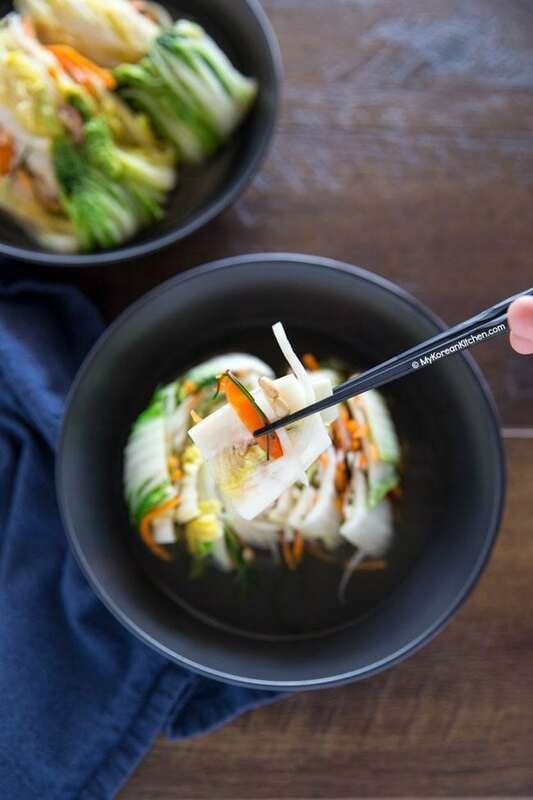 I love the idea of making an aromatic brine broth and keeping it light and clear through infusion. How long do you typically soak the pear, apple, onion, garlic and ginger in the brine? Hi Mina, I typically soak them for about 10 mins then squeeze the remaining juice out. (I use muslin / cheese cloth to make this whole process easier.) 🙂 Hope you enjoy this kimchi! Thank you! I appreciate your respose.